Speedwall is a supplier of low-cost construction technology that provides solutions to housing projects. The core of the Speedwall Building system is its patented panel-making machine and the panels themselves, which are manufactured onsite. The panels are both earthquake and hurricane resistant. 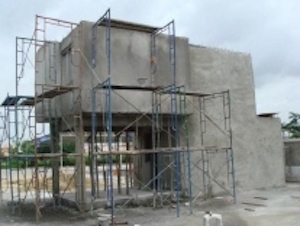 Concrete is sprayed onto the building structures, which are made exclusively out of a framework and Speedwall panels. Speedwall trains contractors in the operation of its panel-making machine and the erection process, while also providing quality control for the successful completion of projects. Speed: one of Speedwall's onsite panel manufacturing machines is capable of producing 240 panels per-day, and can be erected within minutes of production. Easy to use: Speedwall's construction system is simple to use and requires very few skilled staff on site. Lightweight: as Speedwall's panels weigh less than 140kg/m2, the overall structure is substantially lighter than a similar structure built using pre-cast, formworks or plastic molds, without compromising strength. Speedwall Panels are made with a polyinsulator and galvanised steel mesh and can be used as internal and external load bearing walls, floors, partitions, and retaining walls. Speedwall produces its panels onsite in its patented mobile factory, which are then delivered directly to the site and housed in a 40ft steel container. In the early 1980's Frank embarked on a number of major scale international engineering projects in China, Africa and Latin America. After working in these often difficult environments, Frank first devised the concept for what has now become the Speedwall Building System.